Submitted by Mike Penn on 9 December 2018. Click the Media link to see a short video on the variability of the weather here in Antarctica. I'm here with a team of people who know a lot about weather. They are Meteorologists and Atmospheric Scientists. Their job here is to install and maintain Automatic Weather Stations (AWS) all over the continent of Antarctica. There are right around 130 AWS (placed by our team from the University of Wisconsin or entities or other nations) on Antarctica. As a comparison, there are about 50,000 weather observation sites in the continental United States. And remember that Antarctica is nearly twice the size of the continental United States. Having so few platforms to observe the weather in so few places makes predicting the weather here on Antarctica very challenging. It is impressive that the weather prediction is as good and accurate as it is! One of the consequences of the highly variable weather and the lack of precise weather information from all areas of the continent is that flights frequently get delayed or canceled. Since I've been here we've had numerous delays and cancellations on helicopters and fixed-wing aircraft. The most recent have been concerning our flight to the South Pole. 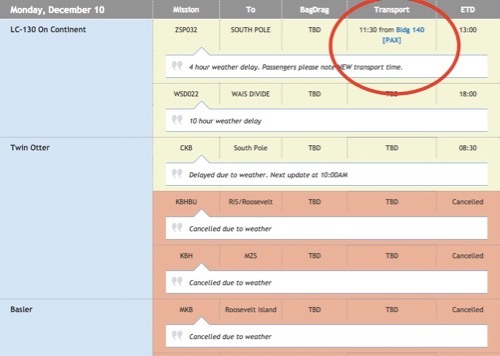 Our original flight to South Pole was for Friday 12/8 and that was delayed until Monday 12/10. This morning the flight was delayed for two hours due to poor weather conditions. 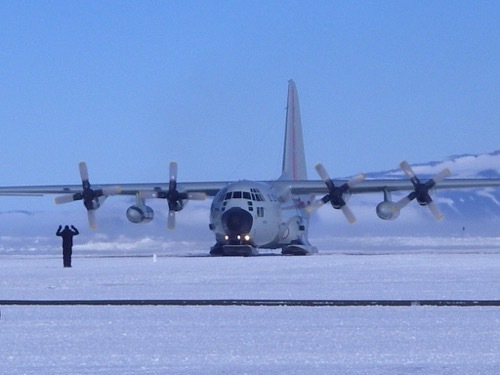 We will be flying to the South Pole on an U.S. Air Force C-130. Our flight to the South Pole will be on a U.S. Air Force C-130. Photo By Lindsay Knippenberg (PolarTREC 2009), Courtesy of ARCUS This flight was originally supposed to happen on Friday, December 8 but was delayed until today, Monday, December 10 at 6:45 a.m. But this morning, I got up and prepared to fly at 6:45 a.m. only to be delayed until 9:30 a.m., and now to be delayed again until 11:00 a.m. this morning. And now canceled for today and rescheduled for tomorrow (Tuesday) morning at 0645. (Remember that I am 18 hours AHEAD of the Eastern Time Zone). Our delayed flight to the South Pole has now been delayed another two hours. I'm not at all frustrated. The reason they flights are delayed is to ensure that everyone (the flight crews and the passengers) are as safe as possible. The only thing that I DON'T like is taking the medicine that is supposed to help with altitude sickness at the South Pole. It is called Diamox and one of the side-effects of the medicine is insomnia. So, since I took it on both nights thinking I was flying to the pole the following day...I hardly slept either night. I am looking forward to going to the South Pole. And being told that I have to wait isn't the hard part. Wondering what the "downstream consequences" of these delays are the hard part. There are several things that may change due to these flight delays. The first is the PolarConnect event that was just scheduled. My PolarConnect is scheduled for December 17th at noon eastern time. I also now have the registration for the 12/17 PolarConnect event. If you are interested, you can register for that here. The PolarConnect is my opportunity to connect LIVE with classrooms about what my team and I have been doing here in Antarctica and answer any questions in real time. I'm really looking forward to that. But, the further that these delays push into the time at the South Pole the more challenging making that PolarConnect happen becomes. There are only two of us going to the South Pole and there is real work to be done there. Two AWS have to be serviced and the likelihood of those happening without delays of their own are pretty slim. 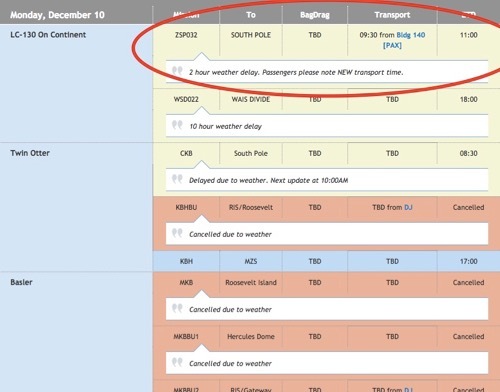 So, the longer the delays last the more challenging the PolarConnect becomes because accomplishing the mission of servicing the AWS at the South Pole becomes more important in a shorter time window. The other downstream consequence of having to stay at the South Pole until the mission is completed is that when I return home could be affected. It isn't a huge problem, I've been told many times that the dates are flexible and my family and I are prepared for that. But if everything went according to the schedule, I'd be home for Christmas. Unfortunately, it doesn't look like Antarctica is concerned about my schedule or my travel plans. Have you launched the weather balloon yet? Aubrielle, Not yet. I did meet the people who do that here in McMurdo but I haven't gotten to do it yet. Where I'm "supposed" to do it is at the South Pole and we haven't gotten there yet due to bad weather. I am looking forward to doing that though! Hi Mike, I have a group of "polar ambassadors" that I am working with in NJ. They have the following questions for you. -What does an AWS do? How does it work? -How does the fuel cache work? Is it free? How does it affect the environment being placed all the way out there far away from everyone? Hello New Jersey Polar Ambassadors! Great Questions! The AWS (Automatic Weather Stations) autonomously collect weather data for specific remote locations around Antarctica. The data they collect (Temperature, Wind speed and Direction, Humidity, Pressure and snow depth) is sent via satellite to the University of Wisconsin-Madison and then distributed worldwide. The fuel cache is "free" in that we didn't have to pay for it on the spot! However, the National Science Foundation and the U.S. Antarctic Program certainly paid for the fuel and it's transport out to "South by 200." Basically, the airplane that we were on and many others simply fly to that location (when necessary) to refuel en route to more remote locations. (Running out of fuel would be...bad!) The NSF and USAP are probably more serious about NOT contaminating the environment here than ANYWHERE else on the planet. The pilots went to great lengths to ensure that not a single drop of fuel was dripped into the snow. They used specialized equipment to transfer the fuel and they obviously knew how to use it. If there had been a spill, the plane is equipped with a "spill kit" and we were all trained on how to collect a spill and properly transport and dispose of it when we reached a station IF a spill had happened. Thank you for reading my journals and taking the time to ask some questions! I LOVE it!